Foodgasm is a yearly event organized by the UP Economic Society along with Mercato Centrale. 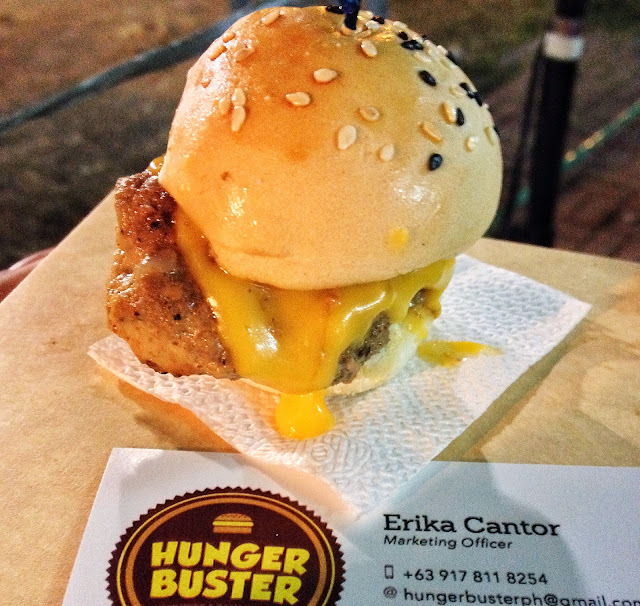 It aims to give way for start up food businesses to showcase and impress the public with their product. 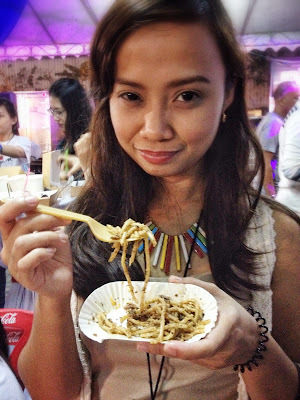 It was my first time being invited as a food blogger-judge for Foodgasm IV. I was very honored and happy because it would be the first time my personal blog would be out in the public. 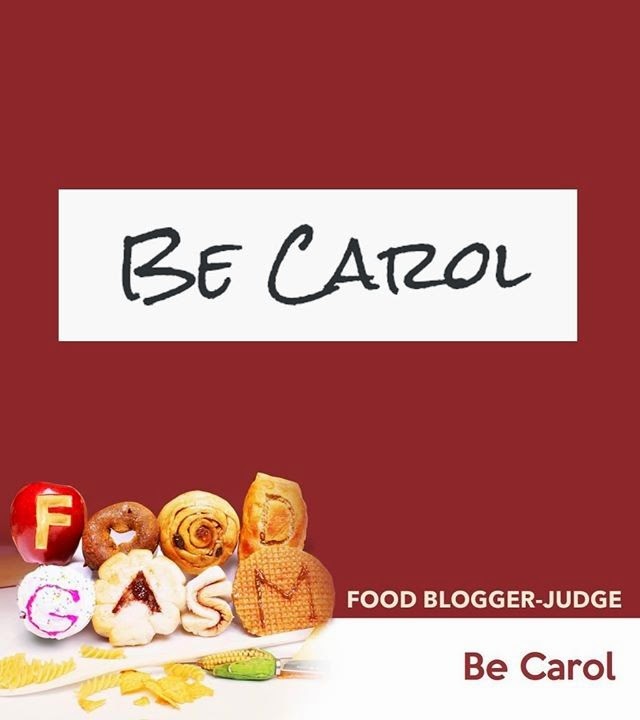 As a food blogger-judge, we were given a chance to have a friend come with us and share the experience. I came with Soshi with butterflies in our stomach, anticipating what food to expect. Foodgasm opened to the public at around 7pm but as a food-blogger judge, our call time is 6PM, giving us enough time to scan the stalls, take pictures and talk to merchants. We didn't have any strategy, we just tried the stalls with less people so we could chat with the merchants. But come 7PM, a lot of people flocked in and continued until 9-10PM. He is the pickiest eater I know that long. As you know, I love experimenting and re-creating food (as you can see with a lot of my blog posts here). Most of the time, He is my food taster. He seemed to not like most of the dishes I recreated. He's not adventurous with food, would ask a lot, nitpicking information about the food, and usually ending up not eating the food. He loves carb-loaded, fat-ladden foods, but veers away with sweets. 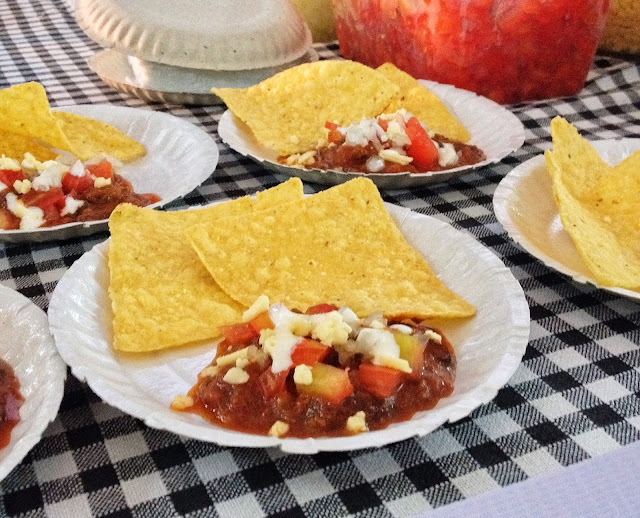 Chili Chili Bang Bang's Chili was your typical home-made chili served with nachos. They sell their chilis in jars or you can buy both chilis and nachos from them. Verdict: It was good, but our giddy stomaches were expecting something different and/or unique. The Bite in the Bullet Chili was the spicier version which appealed better to me because I love spicy food. Soshi finished the nachos. Cuptain Cakes are owned by a very cute couple. The guy is the one responsible with the cupcakes while the girl is in charge of marketing. Verdict: Their Batak Sesame cupcake is good, has a prominent taste of black sesame. Soshi took a tiny bite of the cupcake and gave it to me. He didn't like the taste of sesame. I love black sesame so I was happy he gave it to me. The Elvis pie is quite similar to a Banoffee pie. Caramel, whipped cream and chocolate cake, sinfully good. Verdict: The Elvis Pie was good, just sweet enough for my liking. Soshi did not try the Elvis pie because of the white cream. He eats chocolates he doesn't like the white cream stuff. I even urged him to try the pie by eating off the cream on top, but no luck. Ruby Red Kitchen is owned by Ling McDermott. 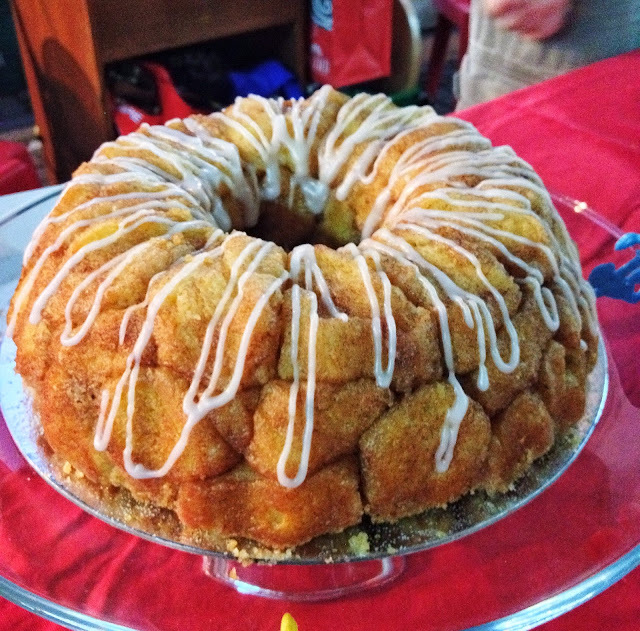 The monkey bread is her original recipe. Verdict: Their Monkey breads are both our favorites. The contrast of flavor on both bread was utterly delicious. The Cinnamon was sweet enough and the Parmesan Herb was savoringly better. I did not even have the need to put some dip. Surprisingly, Soshi loved the bread too. The Polish Pierogi is like a Polish dumpling with unique filling of beef and sauerkraut topped with Onion, Bacon and Sour Cream. Their chorizo recipe is authentic from Cebu with a lot of flavors to choose from like Pork Hamonado, Garlic Pork, Garlic Chicken and others. Verdict: Their Pork Hamonado flavored chorizo was a bit sweet but savoringly good. I wanted to go for another round that night. Mau's Cupcake Cafe is owned by another couple. 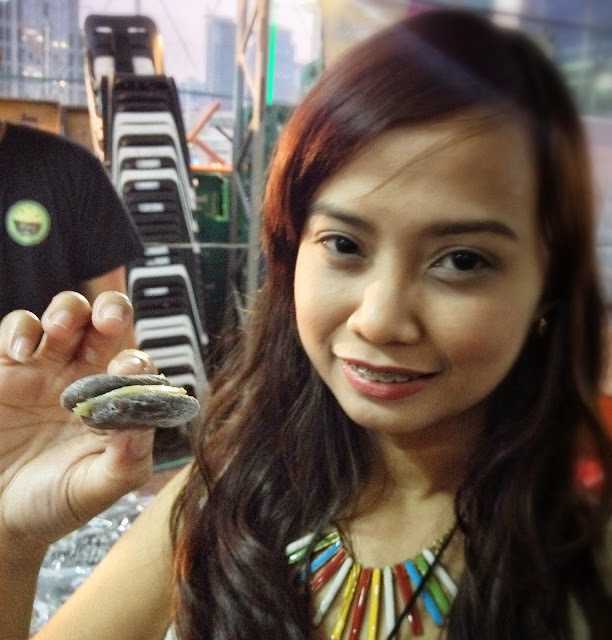 They were the friendliest people we met that night, all smiles, armed with A LOT of Yema Filled Crinkle Sandwich for anyone who wants to try that night. 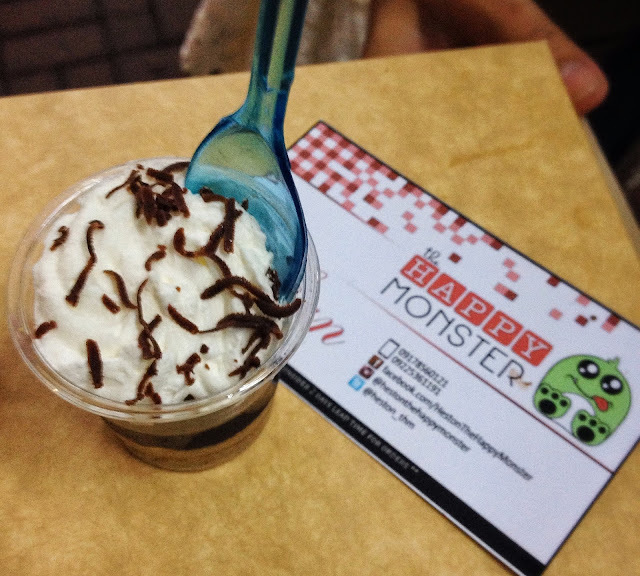 Verdict: This was one of Soshi's favorite desserts that night. I was expecting the Yema Filled Crinkle Sandwich to be too sweet because of the Yema and Crinkle combination, but it wasn't. It was sweet enough to cap off a nice meal. I wonder if they do big sized Yema Filled Crinkle Sandwich, as big as a pie? These are your traditional fries with a mix of Nori bits and Okonomiyaki sauce. Verdict: Soshi loves the Okonomiyaki sauce along with the fries, though he skipped the nori. He loved it so much that I had to give my share to him. It's so rare for me to see him enjoy food tasting. The sauce was the winning recipe. Team Johnny Cheecups are desserts on the go because the cheesecakes are stored in jars, convenient to eat if you are on-the-go but wanted nice dessert. It is also best given as a gift because the jars are cute. Verdict: They have Oreo Cheesecake, Smores Cheesecake, New York Cheesecake. 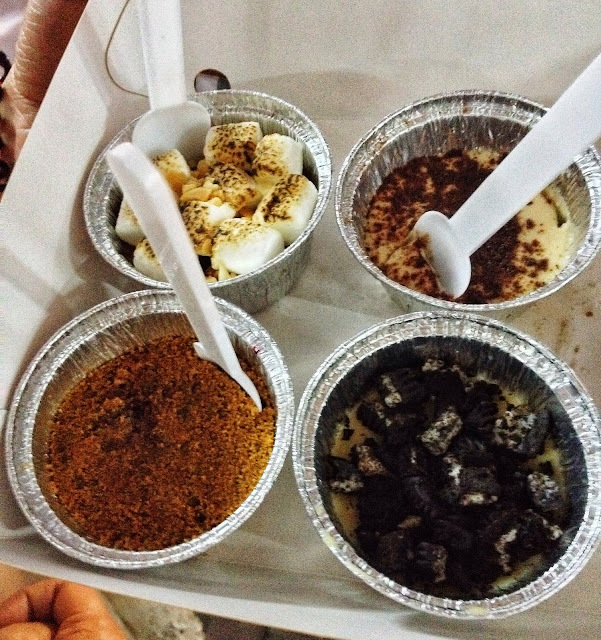 I tried all cheecups while Soshi was hesitant to choose because he's not a fan of cheesecakes. He tried the Oreo Cheesecake, but ended up giving it to me after tasting the cheesecake. He was kind of hoping for a more Oreo flavor than cheesecake. These are simple Biscuit bits with a bit of Bacon. Verdict: It was like a normal butter cookie. I didn't taste any hint of bacon in the biscuit. Soshi asked them why they didn't name the cookies Blue Sky or even colored them blue just to assimilate it to the TV Series Breaking Bad. It would have been more creative that way. 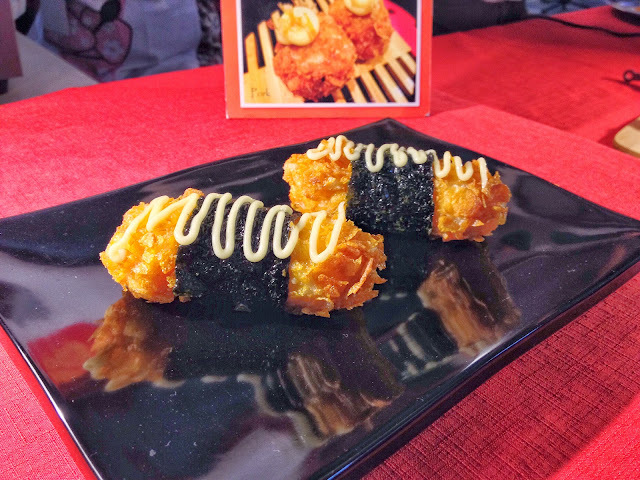 Verdict: The crabsticks were okay. Soshi did not like the mayo so he had to scrape it off before eating his portion. Verdict: There were long lines for the burgers so we decided to just get back on it. people are really flocking for the dying burger because the lines don't seem to thin out. The burger was filling. Our only concern is that it's pan-fried. We both prefer grilled burgers, but otherwise it tasted fine. Verdict: I didn't like the pasta. I love tuyo and oil base/pesto pasta, but there's something in their tuyo-oil-pesto combination that doesn't sit comfortably in my taste buds and I'm not able to discern which contributed to the taste. I gave Soshi my share. Pastillas flavor infused in the Leche Flan. Verdict: The flan was smooth, firm and creamy, the way I liked my leche flan. I was wondering where the pastillas flavor would be? 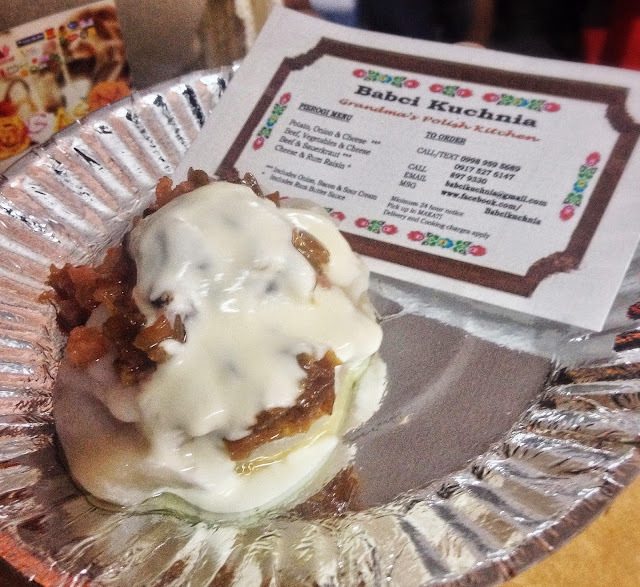 But overall, it was a good version of leche flan. Rhum Balls with different coatings like wasabi, coconut, and chocolate ganache. Verdict: It was good. You can taste the hint of rhum in the chocolate balls. I asked what chocolate they used, they were not able to answer it. I wanted to know if it was Belgian or local chocolates they used. 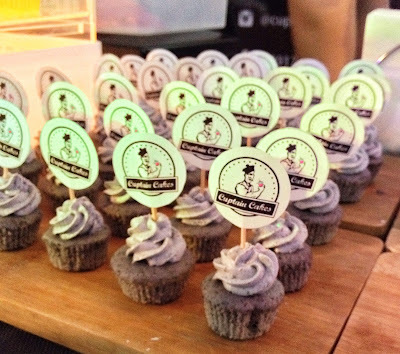 They have a cute booth setup, which clearly portrays the selection of cupcakes for sale in their booth, even the full-sized Oreo Whoopie cupcakes. Verdict: The Oreo Whoopie cupcake was too sweet for my liking. Soshi did not touch his the second he saw the cream cheese filling. A lot of good food had been tested and it was hard to select which one has is the most innovative one. A lot of people came and tasted the samples, winners were awarded around midnight. Yay! Our picks have won (Ruby Red Kitchen)! 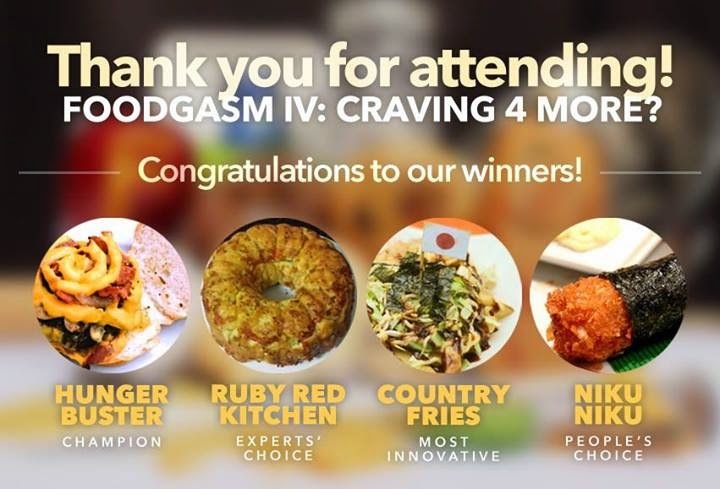 Congratulations Hunger Buster, Ruby Red Kitchen, Country Fries and Niku Niku. Thanks you UP Economic Society for the invite. We had fun and so as our happy tummies! 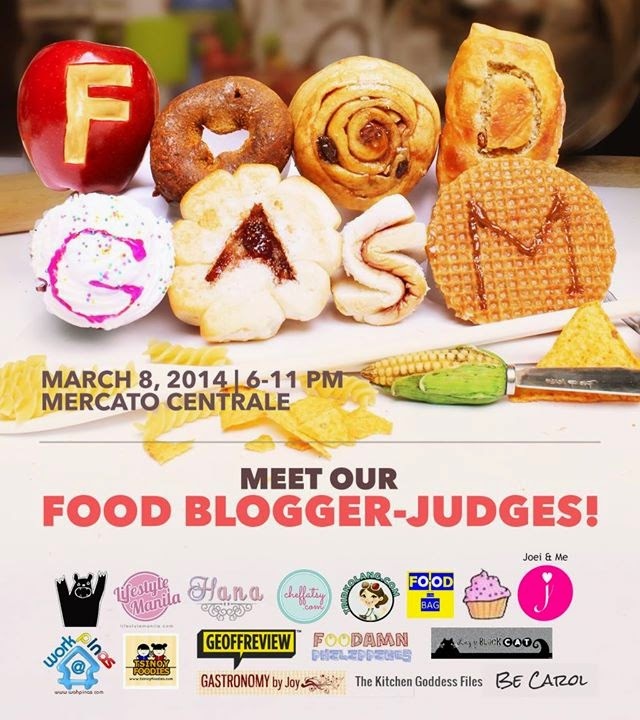 Like the Foodgasm Facebook Page for updates on the next Foodgasm event. *some of the photos are taken from the Foodgasm Facebook page.